You might not believe it but this is the best iPhone 4 knockoff on Earth. We have seen several iPhone knockoffs since the day we started this phenomenal blog, and we can say that 8 out of 10 iPhone knockoffs are crappy in terms of software, they just do not have the qualifications to compare with iOS. They look very similar to the real deal, but the user experience is very bad. While we are thinking to give up on looking for an incredible one, we came across an amazing iPhone 4 look-alike which is powered by Android but look and act more like iOS. We are now recommending you to check out an 11-minute-long hands-on video (in English) after the break. Yeah, it is made in China. We love it. 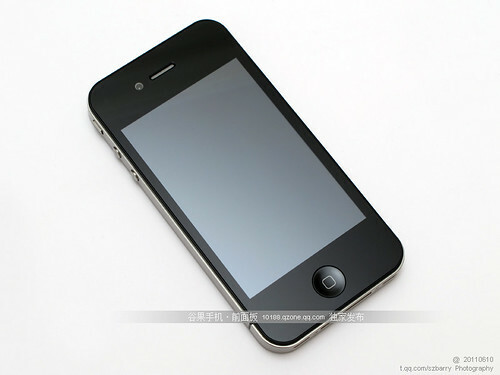 Brought to us by GooApple, this iPhone 4 knockoff, GooApple 3G, is really a pretty badass. The specs? Well, the GooApple web site doesn’t tell us the phone specs, but we managed to check out more information from the Chinese web, and here’s what we know. 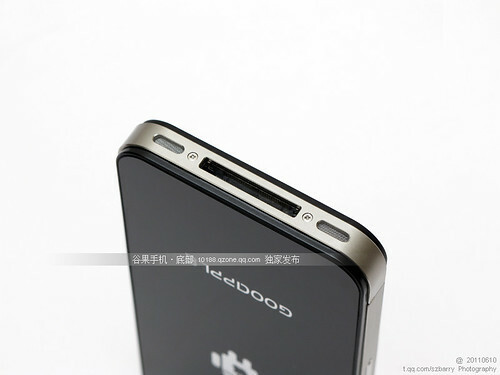 It boasts a 3.5-inch capacitive display, 3G (WCDMA) connectivity, Wi-Fi, GPS, a 5 megapixel rear camera, and sports some form of Qualcomm CPU (probably 600Mhz). 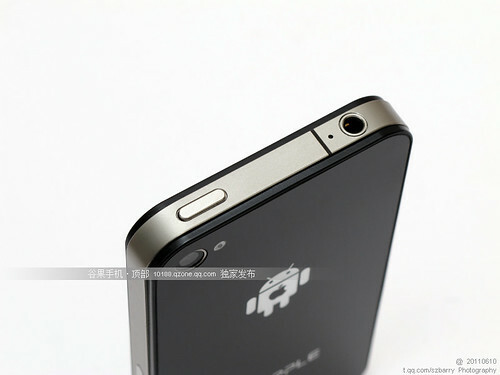 In terms of hardware, the phone measures 9.3mm in thickness, exactly the same as Apple’s iPhone 4. 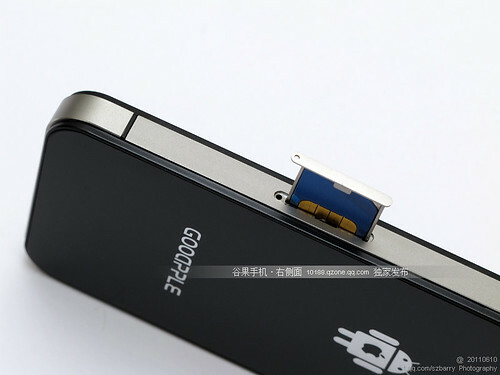 It comes with a stainless steel frame, and interestingly, the phone is situated between two glossy panels of aluminosilicate glass. And it has stereo speakers! And finally, the software. 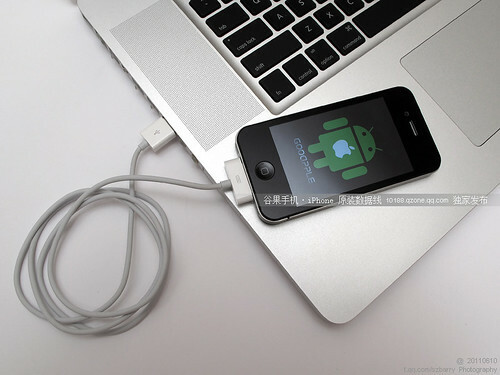 It runs Android 2.2 Froyo, and provides handy additional features, such as a WiFi hotspot and Bluetooth / USB tethering. Enough with the words, enjoy the photos below! Oh, it does not support micro-SIM cards. 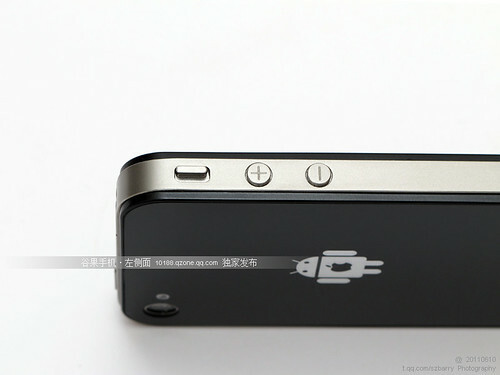 It has a 3.5mm headphone jack. Appearance is perfect, but how about its innards? Too bad, we can’t see its battery capacity. 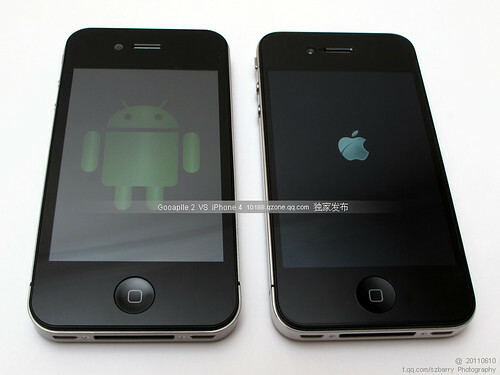 Now, let’s compare it to a real iPhone 4. 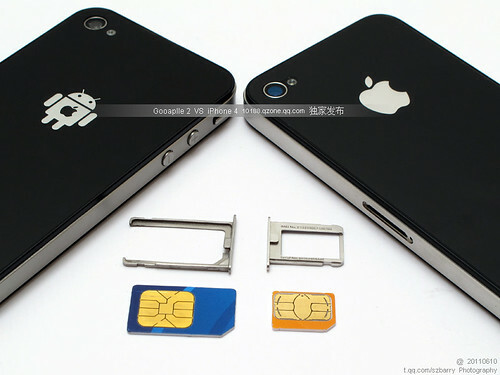 From head to toe, both phones look exactly the same, except the logo on the back panel and the SIM card slots. Let’s look at its software whcih has been heavily skinned to look and feel just like Apple’s iOS. The lock screen and the home screen. 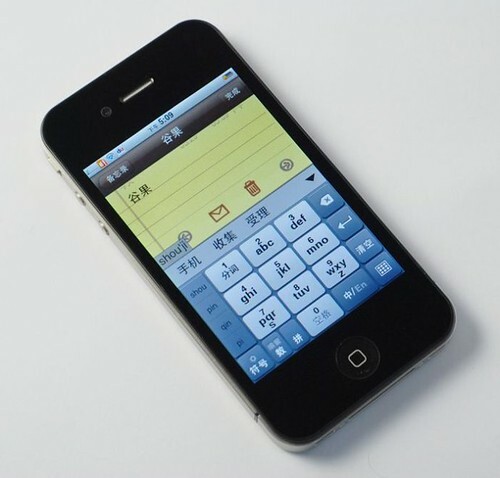 The built-in Chinese pinyin input! Looks complicated. Music player and cover flow! See the Genius and Shuffle icons? Fruit Ninja! And you must see its weirdly awesome booting animation! Great work indeed from the Chinese once again. 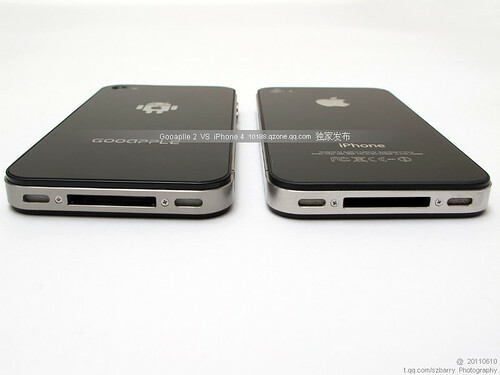 We hope you still remember the best iPhone 4 knockoff of 2010, the SoPhone. Both phones include an UI which works just like the real thing, but GooApple 3G seems to have a better processor and camera. 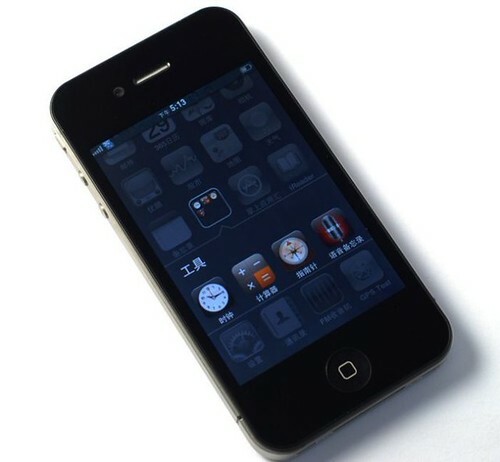 The best thing of GooApple 3G is that it has a same appearance as the iPhone 4, the UI looks and works just like iOS! It’s not easy to differentiate it with the original, but for Apple fanboys, we think the the illusion will be broken when Android’s tell-tale window shade notification drawer is pulled down from the top of the screen. Cons? iOS 5 is waaayyyy more better, let’s hope there’s an update to catch up the new features! 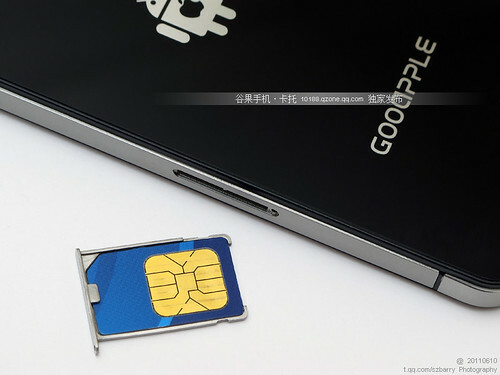 For its price and availability, it will be on sale at the gadget markets of Huaqiangbei, in Shenzhen, starting from June 20, for 1700 yuan (about $262). Price is not cheap, and we think the iPolice will look for the manufacturer since the phone features an Apple logo on the back panel and the booting animation.